If your GPU instance (available in the gn5, gn5i and gn6v families) requires OpenGL, you must install the GRID driver on the instance. The NVIDIA GRID license granted to the NVIDIA GPU (such as P100, P4 and V100) of gn5, gn5i and gn6v instances cannot meet the graphics requirements of OpenGL. However, you can use the trial version of the GRID driver to meet the requirements. This article explains how to install the GRID driver and deploy a desktop environment on a Linux GPU instance running Ubuntu 16.04 or CentOS 7.3. This section describes how to install the GRID driver on a GPU instance running Ubuntu 16.04 64-bit. You have created a gn5, gn5i or gn6v instance. For more information, see create a compute optimized instance with GPUs. Make sure that the instance can access the Internet. Note We recommend that you use a public image rather than an image from the marketplace that is pre-installed with a NVIDIA driver. Otherwise, you have to disable the Nouveau driver after the instance is created. To disable the Nouveau driver, create a file named nouveau.conf in the directory of /etc/modprobe.d and add blacklist nouveau into the file. You have installed a VNC application on your local machine. In this example, VNC Viewer is used. Run the following commands in sequence to upgrade the system and install the KDE. Run reboot to restart the system. Connect to the Linux instance again, and then run the following commands to download and decompress the NVIDIA GRID driver package. The NVIDIA GRID driver package contains the drivers for various operating systems. For Linux OS, select NVIDIA-Linux-x86_64-390.57-grid.run. Run the following commands in sequence, then follow the prompts to install the NVIDIA GRID driver. 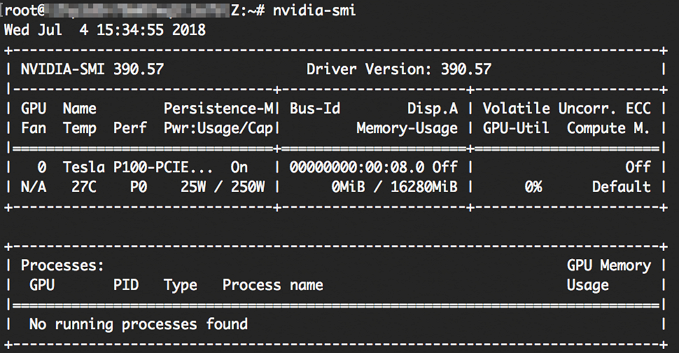 Run nvidia-smi to verify the installation. If the following message appears, the driver is installed successfully. Switch to the /etc/nvidia directory: cd /etc/nvidia. Create a file named gridd.conf: cp gridd.conf.template gridd.conf. Add the following lines about License Server to the gridd.conf file. Run the command to install x11vnc. 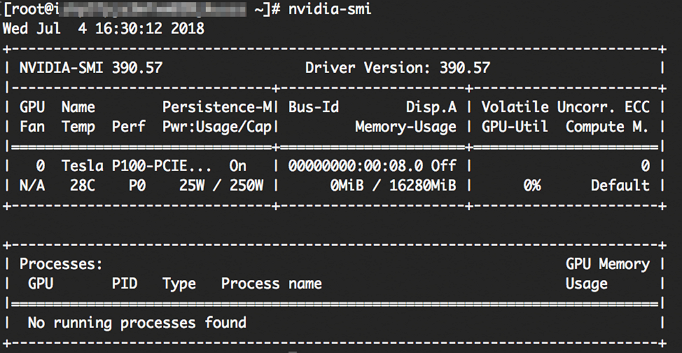 Run lspci | grep NVIDIA to check GPU BusID. In this example, the GPU BusID is 00:07.0. Edit /etc/X11/xorg.conf: Add your GPU BusID to the Section "Device". In this example, BusID "PCI:0:7:0" is added. Run the following command to install the GLX application. Run startx to start X Server. If the startx command cannot be found, run apt-get install xinit to install it. Running startx may result in the hostname: Name or service not known error. This error has no effect on starting X Server. Run hostname to obtain the host name of the instance, and then modify the /etc/hosts file by replacing the hostname, which is preceded by 127.0.0.1, with the actual host name of your instance. Start a new terminal session of the SSH client and run the following command to start x11vnc. If the following message appears, x11vnc has been restarted successfully. Now you can connect to the instance by using a VNC application. In this example, VNC Viewer is used. Log on to the ECS console, and add security group rules in the security group to allow inbound traffic from the Internet on the TCP 5900 port. On the local machine, start VNC Viewer and type in Public IP address of the instance:5900 to connect to the instance and enter the KDE desktop. Start a new terminal session of the SSH client. Run glxinfo –t to list the configurations supported by the current GRID driver. On the KDE desktop, right-click the desktop and select Run Command. 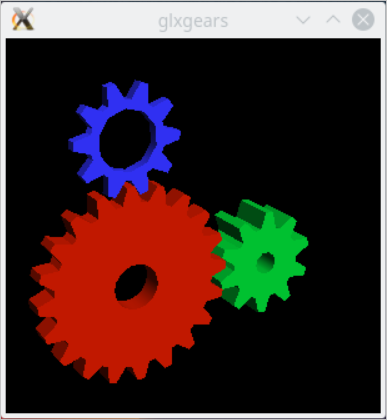 Run glxgears to start the testing application. If the following figure appears, the GRID driver works normally. This section describes how to install the GRID driver on a GPU instance running CentOS 7.3 64-bit. Run vim /etc/modprobe.d/blacklist.conf, and add blacklist nouveau to the file. Run vim /lib/modprobe.d/dist-blacklist.conf and add the following lines. Run mv /boot/initramfs-$(uname -r).img /boot/initramfs-$(uname -r)-nouveau.img. Run dracut /boot/initramfs-$(uname -r).img $(uname -r). Run cd /etc/nvidia to switch to the /etc/nvidia directory. Run cp gridd.conf.template gridd.conf to create a file named gridd.conf. Run the following command to install x11vnc. Start a new terminal session of the SSH client and run the command to start x11vnc. Log on to the ECS console, and add security group rules in the security group to allow inbound traffic from the Internet on TCP 5900 port. On the VNC Viewer, right-click the desktop and select Run Command. Run glxgears to start the testing application. If the following image appears, the GRID driver works normally.